PRODUCT DESCRIPTION: Wheat germ looking bait granule which uses some type of protein attractant that carpenter ants love. It has a slight odor like a type of pet food if you open the container and smell it. However, once applied, you cannot smell it nor detect it is present. 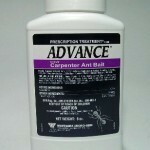 Furthermore, because it is a bait, Carpenter Ant Granules are among the safest material that can be used for this pest. WHERE TO USE IT: Outside around the perimeter of the home making sure you don't get it too close to where you applied any of the liquid foundation treatments since that product will contaminate the bait. You can also use it in turf, around the base of trees, along fence rows, on railroad ties, garden dividers and basically anywhere you see activity and don't want carpenter ants to get established. RATE OF APPLICATION: 1 lb of the granules is enough to treat up to 1 acre. However, when treating around a tree or other areas where you are seeing a lot of trailing ants, be sure to use at least 1.5 – 3 ounces just to insure they gather up enough product to knock them out. I have been buying both Advance Granules and DRIONE DUST for a number of years. Both of these products work amazingly well. At the beginning of the season, when I can see carpenter and other ants common to Indiana, I hit the mounds with Advance and watch the ants do the work for me by going crazy for it as food and bringing it down into the colonies to do the rest of the job for me as well. Awesome. The Drione dust is also great for blasting into crevices. I had a thriving colony of ants living along a seam in my cement driveway and the main garage door. I blasted the dust into the various tiny crevices and watched them come out to do their dance of death. Within 20 minutes the colony was done. The Drione dust is also great for yellow jacket nests in small spaces. I blast it into tiny holes in my roof and they are d-o-n-e! (Note: Do this at night when they are all in the nest and slow moving). This stuff kills carpenter ants. 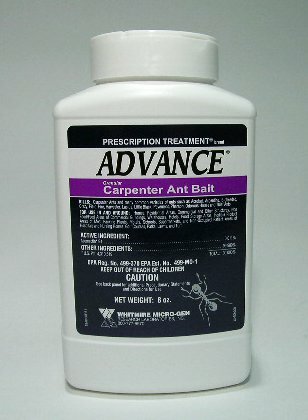 When ever I see carpenter ant activity in my yard I spread this product in the area and in a few days ant activity is gone. We have ordered three products. We had a problem with yellow jackets in a wall and under the house two years ago. We used a crusader duster and dust. We have no problem with them since then. This year we had carpenter ants in the house and in the grass near the house and wood shed. We order dust, grains and the gel. They worked great. We found the nests and we now have no carpenter ants. Thanks! These products are so easy to use and work like nothing we have ever seen. I have a pet dog, is there a way to use this product and keep him safe? In fact all of our products have been created to be used safely both inside and outside the home. More specifically and relative to this product, there would be no hazard to your pet or even to people when used properly. The reason for this is simple. Insects are very different from mammals. And though insect baits will impact the insects which feed on them, this methodology does not work on mammals. Our digestive system (yes, this applies to all mammals including people) is such that even if we ate any, it would just be processed as food. That's not to say we should be snacking on insect bait; it just means that if any is accidentally consumed it won't matter. This is also why insect baits can be liberally used both inside and outside the home. And though they tend to work slower compared to more traditional "sprays", insect baits can have a profound impact because they take advantage of that which most insects are always doing: looking for food. For this reason we usually recommend them to be used when trying to control a range of insects including ants, roaches and crickets.